Enjoy a little bit of decadence. 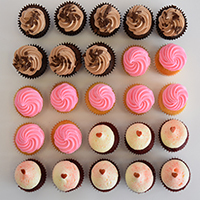 The Cupcake Desire offers delicious mini cupcakes in a range of flavours. Perfectly sized for those looking for a small indulgence, they’re the ideal choice for everything from children’s birthday parties to large corporate functions. Make the smarter choice and choose a respected local baker for your next event. The Cupcake Desire makes beautiful desserts fresh every day from the very best ingredients, offering them at some of the very best prices in the city so everyone can enjoy a bit of deliciousness. 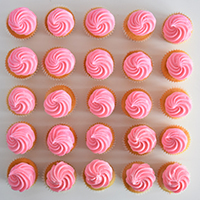 Sample something from our bakery and place an order for our mini cupcakes today. Whether for a backyard barbecue or a company fundraiser, when there are a lot of mouths to feed, you can’t go wrong with our mini cupcakes. The ideal size for a bite with a cup of tea or after a meal, they always hit the spot just right. Available in three of our delicious flavours – red velvet, chocolate chocolate and vanilla vanilla – you’re sure to find something to please everyone in our mini range. All made with the same love and care as our full size cupcakes, they deliver the beautifully moist texture and perfectly balanced flavour you’ve been looking for in a dessert or afternoon tea snack. 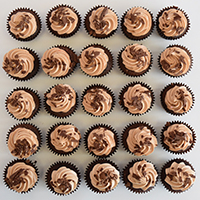 Take a look at our mini range today and discover why a box from The Cupcake Desire makes an appearance at so many corporate functions and private parties. 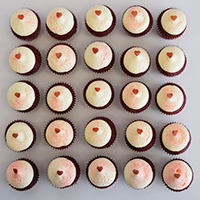 Buy a box of our mini cupcakes through our online store today and discover what you’ve been missing out on. Any questions about our process or want to enquire about making a special order? Get in touch via email at info@thecupcakedesire.com.au or by calling us directly on 03 9705 0051 and get the answers you need.